Hi everybody! My name is Alan and I have recently built a 25EH5 amplifier using an old stereo console I found in the trash. I finally got drew up a schematic for the amp, and there are also pictures posted in the forum of the amplifier, so if any one's interested in getting some building tips, design tips feel free to ask. 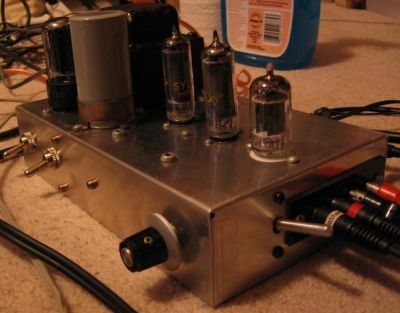 This was actually my first tube amp build that worked on first try so I'm pretty proud of it but I'll try not to make too big a deal out of it. Well hello again, I've transferred the file to jpg and as you said, it should work. I will say this, the only difference from your schematic is the rectifier tube and preamp. Oh, yes and one more thing, I am off school this friday Oct 24 and will probably be on the site. I'm also give compliments to your amplifier design as it sounds great even though it's only 1.4 watts per channel, I find it to be the best sounding headphone amplifier, and even does a decent job of driving inefficient speakers. Personally I like to keep amps simple, using less capacitors as they do sound better, and no capacitors at the output, just a impedance matching transformer. In some ways I still like the way you designed the case and layout just from a useless cooking pan, as it looks real cool and compact, heck, even my dad thought it looked cool! That looks good. 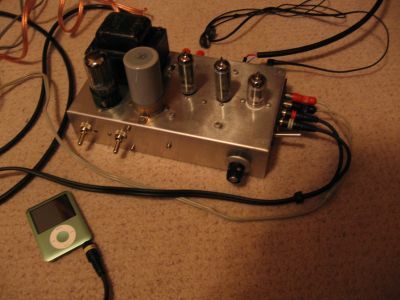 For reference, here is my 50EH5 Tube Amplifier. I did not come up with the design, I used the typical operation from the datasheet. I plan on revisiting this amp to clean up the wiring and replace the 100uF with the same small Blackgates you used (I purchased them some two years ago!). I had also thought about using LEDs instead of the cathode R and capacitor. 15 ohms R is good for 16 ohm headphones. For 32 ohm phones, 10 would be better. Well, your project was the reference I used when I was building my amp. But because I found that exact stereo console in the trash, I decided to use some more of my junk to add a low level preamp for my ipod. I did use a 15 ohm resistor for my headphones as they were 16 ohms, and I even tried this setting with 32 ohm headphones which worked just fine but there was a loss in gain. As for the BG's and Riken's they added a very detailed sound, and I do have a video that I made when I tested the amp, by playing some heavy Metallica through some 80 watt satellite speakers. Although at first the amp had a little too much edge to the treble, it started to sound a bit more relaxed after a few days of burn in time. I would still be interested in sharing my results as a project page, as there are many people that may be interested in building an amp like yours or mine. But for now I will say 73 and as you say "cheers"! Sure, post the schematic here and I will place a link from the project page. AES has some smaller PTs, one 125V @ 15mA. A P-T442, under the Hammond Power Category. Can someone tell me if this will work? That transformer will not be large enough. For each tube, the Maximum Signal Plate Current is 42 mA and the Maximum Screen Current is 14.5 mA. Also, the tube heaters are 50V at 150 mA. You should check out Hammond manufacturing. There is a power transformer there, 269AX should do the trick as it has 125-125V @100ma, you can use a half wave bridge to get just 125 volts. As for the filaments I would use a different transformer say 166F50 or 166G50 if your going to have DC regulation. There are also lower filament voltage tube types such as the 25EH5 that I used, and have seen 6EH5, which would be a better choice but are harder to find. For the filament supply on my amp I used an old VCR transformer that had 18VCT winding and an 33V winding and DC regulated the supplies for more stability. I also added a switch so I could flip between the used 50EH5's and my new 25EH5's. You can also just use the 12-120 volt trick using a couple of 12 volt transformers, or even better two 50 volt transformers, or go digging through the trash, thats were I found my parts. Today I replaced the old cathode bypass caps with 100uF/10V black gates. Nice improvement, likely due to age of the replaced caps (not the brand name ). I also swapped out the old tubes for some new old stock (NOS) 50EH5 tubes I had picked up at a antique radio meet this fall which made. Huge improvement. You should post the updates on the web page Gio, and I'm still patiently waiting for information page on the amplifier I made. You should upgrade the old cathode carbon resistors you have in your amplifier to the Riken 62 ohm types, not shure what kind of improvement they make but they have a 1% tolerance and 62 ohms is the exact bias value. A small update on the preamp stage... I tried a 6CG7 instead of the 12AX7, and it worked real nice, it looked nice too. The only difference is that the filament is wired differently and uses 600mA, I have a switch in the power supply so I can swap between the tube types. So 12AX7, 12AT7, 12AU7, 6CG7, and with an octal socket you can use the 6SN7 or 6SL7. I find the preamp to be very convenient because I can use my ipod with the amplifier without a seperate unit like the Mini Tube Preamp which still gives me allot more gain, but could easily be integrated with the amplifier. The addition of a headphones jack is is also convenient, and this amplifier has more than enough power to drive 16 and 32 ohm headphones, and because it is so simple I find recordings to sound so pure from this amplifier, personally I think it works better as a headphone amp. A later update will be to upgrade the 50EH5/25EH5 filament power supply into a smaller one with a switched power outlet on it, I have sometimes forgotten to heat up the 50EH5 tubes before applying the HV, amazingly nothing visually happens but I know its not a good thing.